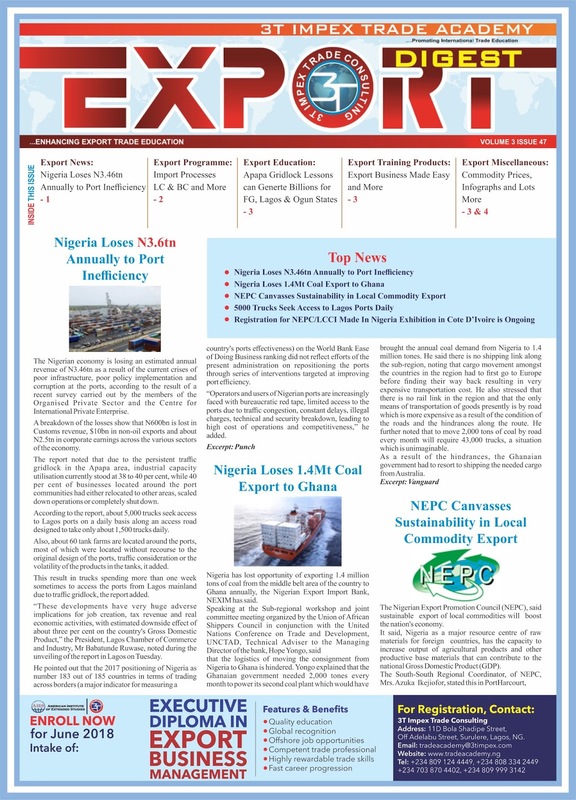 The recent development at the Nigerian ports in Lagos which showed that over 2,000 export containers were delayed as a result of inadequate documentation is a welcome development for the growth and sanity in the non-oil export sector in Nigeria. I will like to say kudos to the Nigeria Custom Service for the courage to take this bold step. Before now, a number of items were usually exported out of Nigeria without documentation and one will begin to wonder how these products are able to leave the country while the Customs are supposed to be guarding the border. The report of 2,000 export Containers being delayed which emerged from the port last week is an indication that the Nigeria Customs Service are now living up to their responsibility of ensuring that any item leaving Nigeria adhere to the export documentations and guideline and thereby aiding the correctness and accuracy of the export statistics from the relevant government agencies in Nigeria. Generally, three sets of people export items out of Nigeria without documentation for a number of reasons. Basically we have the illegal exporters who want to export contraband products out of Nigeria, manufacturers coming from abroad to buy raw materials and the corrupt individuals who wants to launder monies that were obtained through illicit means. The first on the list are illegal exporters. 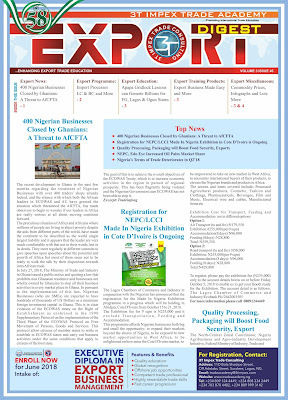 Illegal exporters are individuals who want to export contraband out of the country or items on the export prohibited list, knowing fully well that banks will not process the transaction, they would rather send the goods to the port and find their way through customs and get the goods out of the country by probably bribing them. The second set of people are foreigners who have been sent in to the country basically to buy raw materials for their companies. They usually would come in with foreign currencies like USD and convert them to Naira. They partner with a Nigerian company to open account of which they are the sole signatory and through this they are able to receive the USD, convert to Naira and with the Naira, they are able to buy commodities and ship them to their companies abroad. They don’t have the plan of repatriating the funds and this account for the reason why they don’t go to the bank to process pre and post documentations for their shipments. The third group of people are corrupt individuals who are either politicians or in the corporate world who are able to obtain cash in bribe or through other illicit transactions. In the bid to launder and thus clean the money and to make it appear as legitimate fund in the eye of observers, they would use it to buy commodities and export the products out of the country without documentations and this proceed of crime is then remitted to a foreign currency accounts offshore. Whoever is seeing the funds in such account will think they are clean because it can be traced to a particular transaction. Out of the this three categories, the only one doing legitimate business and need help are the people who represent their manufacturers from other country who have legitimate means of raising their funds but however, doing the right thing the wrong way by exporting the right products without documentations. I will recommend that they make their transactions legal forming an alliance with Nigerian companies and use this to bring in the funds legally. This can be done by declaring the purpose of the funds through the application for the Certificate of Capital Importation (CCI). With this, they will be able to legally repatriate their funds back to their country after they have exported their goods and bring back the export proceeds. This way, they will be able to bring money into Nigeria, buy their products, ship the products out of Nigeria, get the proceed back into Nigeria and eventually repatriate the proceeds to wherever they want it using their CCI. Finally, I will like to say a BIG thank you to the Controller General of the Nigeria Custom Service for eventually enforcing this regulation. I will also like to plead with the management of Customs that they should not allow the likely pressures for any quarter to make them to redeploy the relevant Custom Area Controllers who are very patriotic and have summoned the courage to implement this export guideline. Indication has emerged that the Naira-Yuan swap deal between Nigeria and China is not likely going to be as successful as earlier projected. 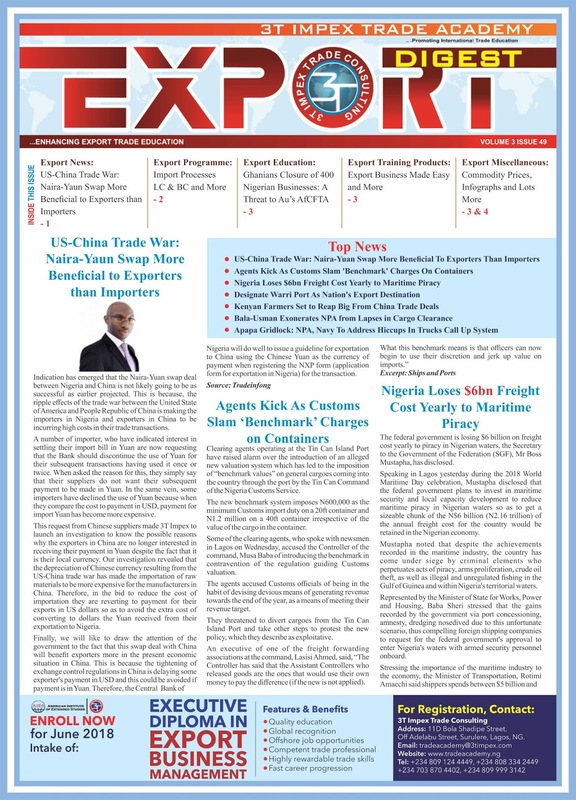 This is because, the ripple effects of the trade war between the United State of America and People Republic of China is making the importers in Nigeria and exporters in China to be incurring high costs in their trade transactions. A number of importer, who have indicated interest in settling their import bill in Yuan are now requesting that the Bank should discontinue the use of Yuan for their subsequent transactions having used it once or twice. When asked the reason for this, they simply say that their suppliers do not want their subsequent payment to be made in Yuan. In the same vein, some importers have declined the use of Yuan because when they compare the cost to payment in USD, payment for import Yuan has become more expensive. This request from Chinese suppliers made 3T Impex to launch an investigation to know the possible reasons why the exporters in China are no longer interested in receiving their payment in Yuan despite the fact that it is their local currency. Our investigation revealed that the depreciation of Chinese currency resulting from the US-China trade war has made the importation of raw materials to be more expensive for the manufacturers in China. Therefore, in the bid to reduce the cost of importation they are reverting to payment for their exports in US dollars so as to avoid the extra cost of converting to dollars the Yuan received from their exportation to Nigeria. Finally, we will like to draw the attention of the government to the fact that this swap deal with China will benefit exporters more in the present economic situation in China. This is because the tightening of exchange control regulations in China is delaying some exporter’s payment in USD and this could be avoided if payment is in Yuan. Therefore, the Central Bank of Nigeria will do well to issue a guideline for exportation to China using the Chinese Yuan as the currency of payment when registering the NXP form (application form for exportation in Nigeria) for the transaction. The current trade war between the US and China might soon start to have a ripple effect on Nigeria and this could spell doom for the economy if the current over dependence on China for critical Items in the manufacturing sector of Nigeria go on without being checked. When it comes to examining the risk of importation to a country, we seem to only focus on the impact on foreign reserve and the nature of the items being imported and not so much is being said on where we are importing the goods from. 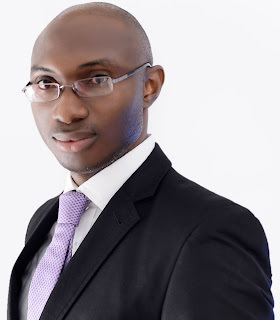 In my opinion, I think the Real sector of Nigerian economy is seriously susceptible to a major risk called concentration risk because of the over dependence on China as the major source of our items of importation into Nigeria. 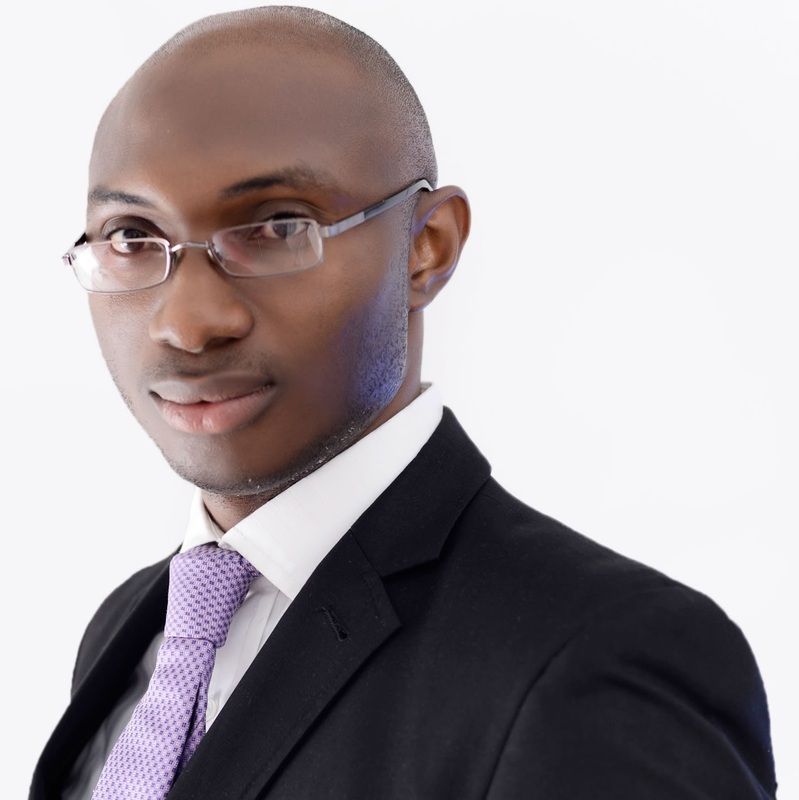 The economist will tell us that the economy of any nation comprises four interrelated sectors, operating to ensure that resources are best utilised in the production of goods and services to maximise the welfare of its citizenry. The sectors are the financial, fiscal/government, external and real. While all four sectors have important roles in the welfare of the citizenry, the role of the real sector is particularly significant and strategic. It is the sector responsible for the production and distribution of goods and services (from a combination of factor resources), necessary to meet the consumption demand of an economy. It drives economic growth and development, and provides an indication on the living standard of the citizens of an economy and the effectiveness of government’s macroeconomic policies. Furthermore, it facilitates the creation of economic linkages with other sectors and helps in capacity building, employment and income generation. In view of this, a discussion of the real sector is topical as it is the pillar upon which the government’s objective of inclusive growth and poverty alleviation hinges, since it contributes the most to employment generation and growth. However, the real sector of the Nigerian economy is under threat and no one seem to be observing the trend and bring it to the front burner and hence nothing is being done about it. The wise man sees evil afar off and do something to avert it, but the fool will wait until it he feels the impact before doing something about it. Looking at the data of Import from China since 2013 to 2017, you will observe that the volume of importation from China has consistently been above 20% of the total import into the country. 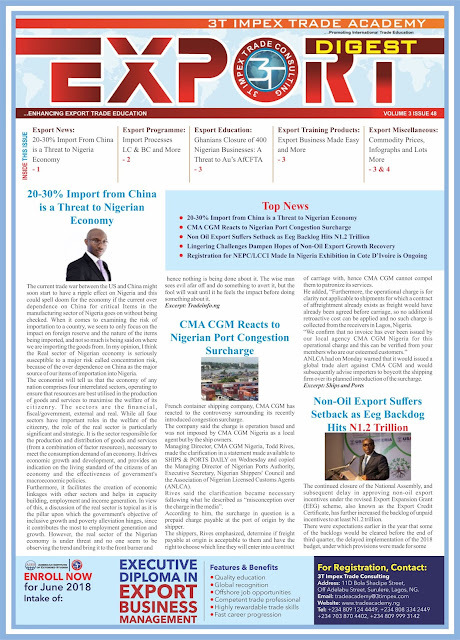 For example, in 2013, about 22% of the total import volume into Nigeria was from China. The volume of importation from China increased to about 26% in 2014. In 2015 the total import volume from China into the Nigerian market jump to a whopping 35% while that of 2016 and 2017 were about 25% and 20% respectively. In the year 2017, Nigeria imported goods worth $28.9 billion from different parts of the world. Out of this, about $5.85 billion worth of goods were imported from China and this accounts for about 20.2% of the total import into the country. What is of interest to me in this particular year is the fact that a good chunk of the products are inputs at different levels and stages to the manufacturers and processors in the country. For example, out of this, about $3.9 billion was used for the importation of machines and computers, $1.7 billion was used to import electrical machinery and equipment, about $2.4 billion was used to import raw materials like cereals, minerals and plastics articles for the plastics and rubber industries while about $646 million was spent for the importation of other raw materials that are chemicals. A number of people might argue that, the reason why many people are flocking to China to purchase what they need for their factory is because of the competitive prices. To the extent that this is true, however, I think the government has the responsibility to look beyond profitability and focus on the impact of this concentration risk on the economy. If this trend continues unchecked and China experience any form of economic challenges, which has already started from the depreciation of Chinese currency resulting from the trade war between the USA and China, these will have an adverse effect on the Nigerian economy since all the factories that solely depend on China will have to either contend with the resulting high cost of importation from China or close down their operations. The implication of over reliance of the manufacturing sector of the Nigerian economy on a single country is far reaching. An adverse situation in the politics and economics of China mean a decline in the importation of machineries, raw materials and spare parts. This might consequently leads to the reduction in product output and thus leading to a decline in income and profitability of such organisation and possibly a recession in the Nigerian economy. The implications of all these is retrenchment of workers and increased unemployment in the country. A government that is forward thinking will not wait until things get out of hand but rather put processes and system in place to mitigate this before it becomes too late. Some of the things the government can do is to first commence sensitisation among the players in the concerned sector of economy to let them know the implication of what they are doing to their businesses and the economy in general. In addition to this, the government can use some of the tools at his disposal to discourage over reliance on China and encourage the purchase of similar products from other parts of the world. Some of the government tools that can be very effective to get this done is Tariff, Tax holidays, VAT exemption, Import Origin Quota etc. It is my firm belief that if these tools are dynamically and strategically deployed, then we can effectively avert the likely doom that could “bedevil” the Real Sector of the Nigerian economy very soon. However, if we continue on the current path of unabated increase in the dependence of the critical sector of our economy on importation from China (or any other country), then we may be in for a very hard time if these perceived risks eventually crystallised.